I’d have to examine this blog’s archives, an activity worth doing on only the rainiest of days, to discover whether or not I’ve ever done a part two for a story before. Off the top of my head I’d say no, but the top of my head frequently is not reliable. Nor are the middle or bottom sections of my head, come to think of it. Not much I can do about any of that though. I was born that way. In any event, soon after I completed my article about artistically-adorned motor vehicles (click here to read it), I was pretty certain that I would revisit the topic. I mean, I’d had fun driving around, keeping my eyes open for good-looking and creative designs painted on the sides of trucks and vans. And taking photographs of them. Three months later the itch to do so again became strong. Itches need to be scratched, as everybody knows. And so, last week, seeking beauty, I took to the roads and to the shopping centers in my suburban Philadelphia area. And beauty I did find. Now, eye-catching trucks and vans and buses are not uncommon, comprising maybe 15% of the commercial and public vehicle population, I’d estimate. Driving along, you see plenty of them on the road. But, unless you have a death wish, you’d do well not to attempt to photograph them from a moving vehicle. I was tempted to on many occasions, but I kind of enjoy breathing. So I didn’t. Which is why I hunted my prey in shopping centers and strip malls, where I was able to drive slowly, scouting out the parking areas and store delivery sections. I set off early on Wednesday morn and kept at it for three hours, a lot of time to devote to an admittedly loony quest. I drove all over the local map, visiting shopping places that I’d been to often over the years, and some I’d never ventured to, despite their being not much beyond spitting distance of my home. 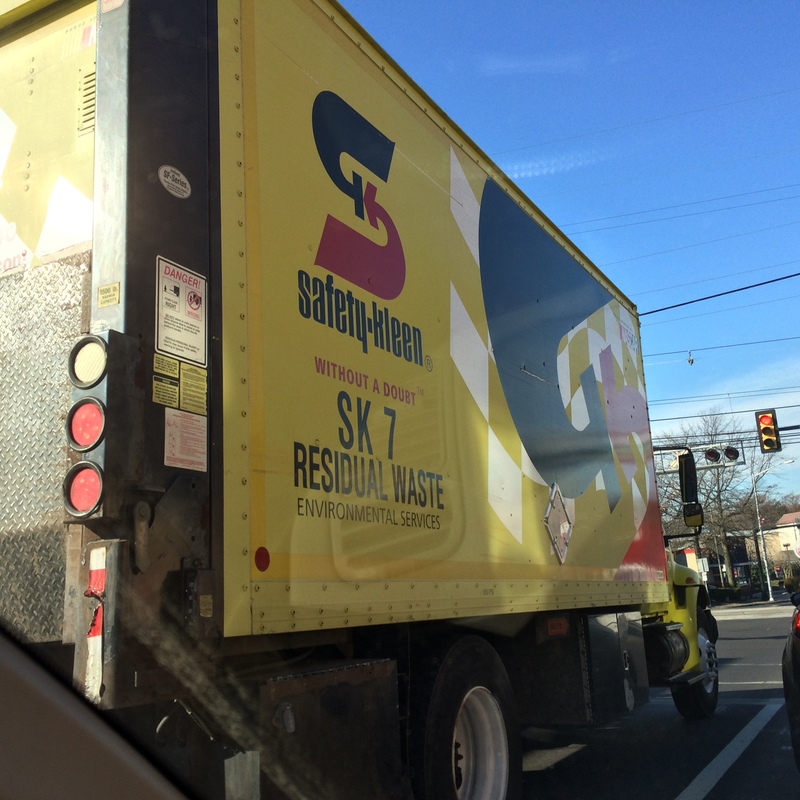 And, much to my delight, I snapped a photo while on the road of a snazzy waste disposal truck, its sides a vision in yellow and cool shapes, while beside it as we both waited for the traffic light to turn green. It was a hit-or-miss operation, a question of being in the right place at the right time. As is much of life. And I was in the wrong place more often than not. I couldn’t believe how I kept coming up empty while trolling the huge receiving docks sections of the types of stores that, in some sense, have come to rule sizeable chunks of the world: Target, Lowe’s, Walmart, Staples. What the f*ck? Not only were there no gorgeous trucks there, for the most part there were no trucks at all! But hey, just when I was giving up hope during various intervals of my expedition, something fine came my way. 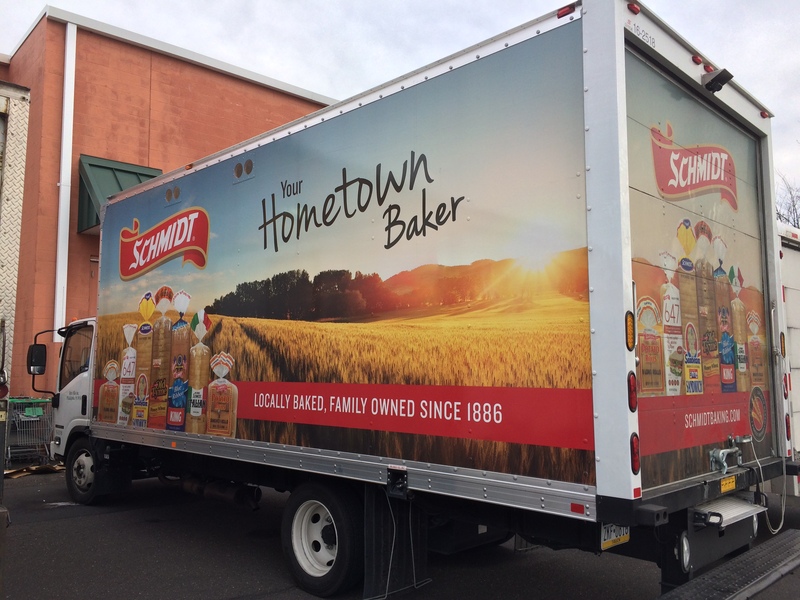 Such as the image of a sun-drenched wheat field decorating a Schmidt Baking Company truck. I encountered the vehicle in the supermarket where my wife Sandy and I do most of our grocery shopping. Even better was what I saw in the desolate rear of a Wegmans supermarket, seven miles from my house. Fresh off the strikeouts at Lowe’s, Walmart, etc., I was expecting to uncover nothing there. But lo and behold, what was that in the distance? I drove closer and grinned. Why, it was a masterpiece, my favorite canvas of all I was to see that day. Luscious, exploding with color, the Wegmans veggie painting made me shout “yo, stop the presses! I’m going to become a vegetarian, and maybe even a vegan!” Luckily there was nobody around to hear my outburst. A nanosecond later I reconsidered what I’d said and tossed the idea in my ancient Honda Civic’s ashtray. 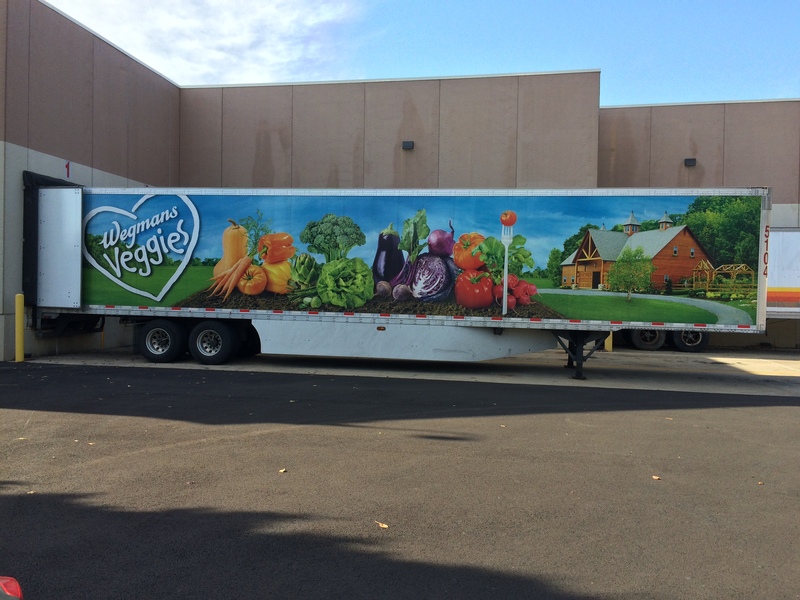 But I will say this: The Wegmans truck artist sure as hell knows how to make a humble trailer look exquisite. I drove away with all kinds of warm and wholesome feelings in my heart. A few days after completing my photographic mission a number of things occurred to me. For one, it seems as though you don’t see a whole lot of dazzling trucks or vans with black as their base color. Strange, considering that a hefty percentage of the cars and SUVs on the road are painted black, and that black is a staple in hip fashion. 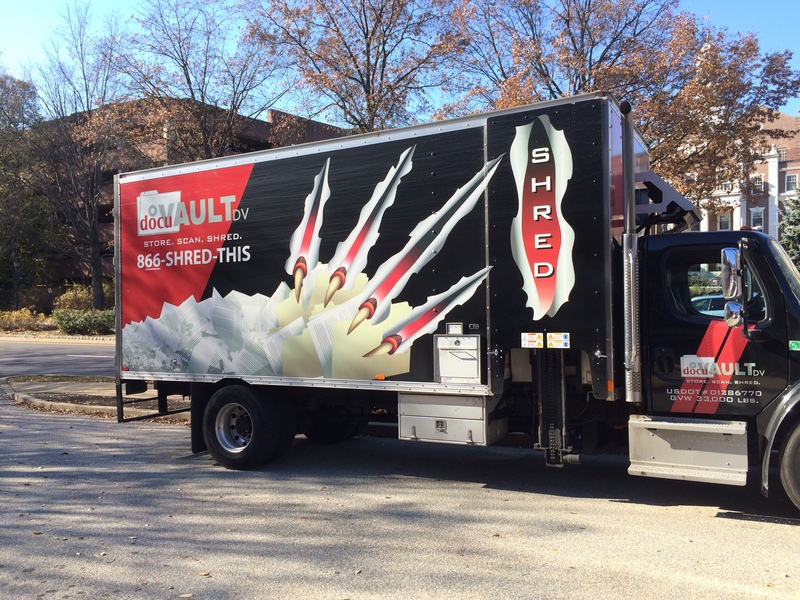 I came across but two fine black-based commercial vehicles: The Shred truck pictured a few paragraphs above, and Air Purity Experts’ van. Both shone like gems. 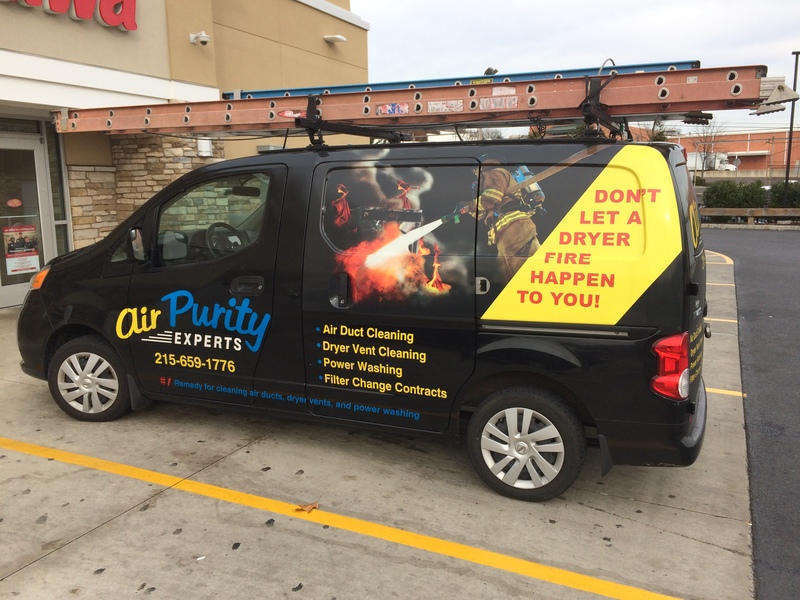 The Air Purity van was parked behind a Wawa convenience store, around one of the building’s corners from a Coca-Cola truck. 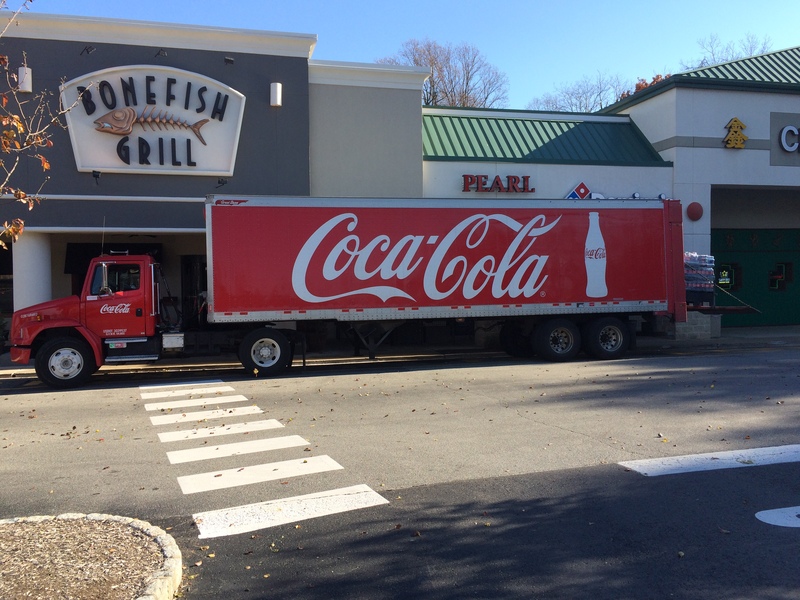 That truck was the second Coca-Cola deliverer I went eyeball-to-eyeball with that day. 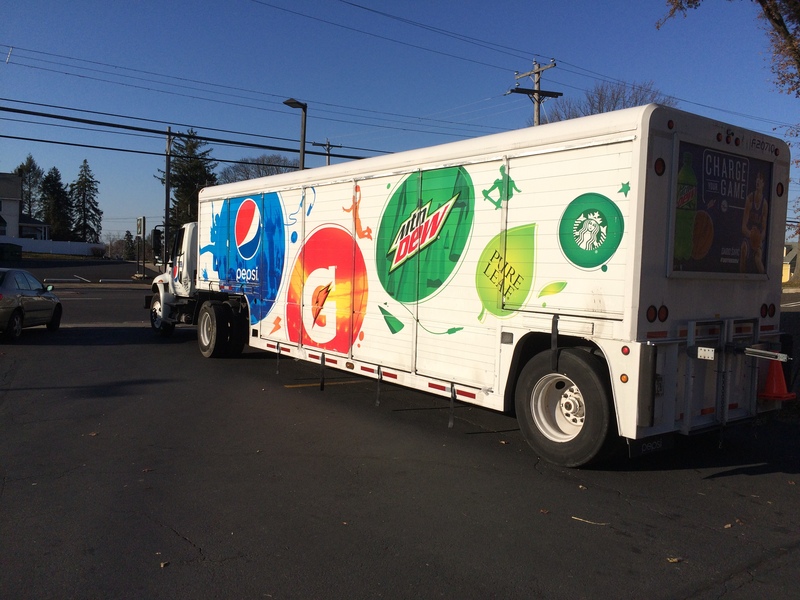 The designs on the sides of the Coke vehicles were different yet sublimely similar. And both are timeless. 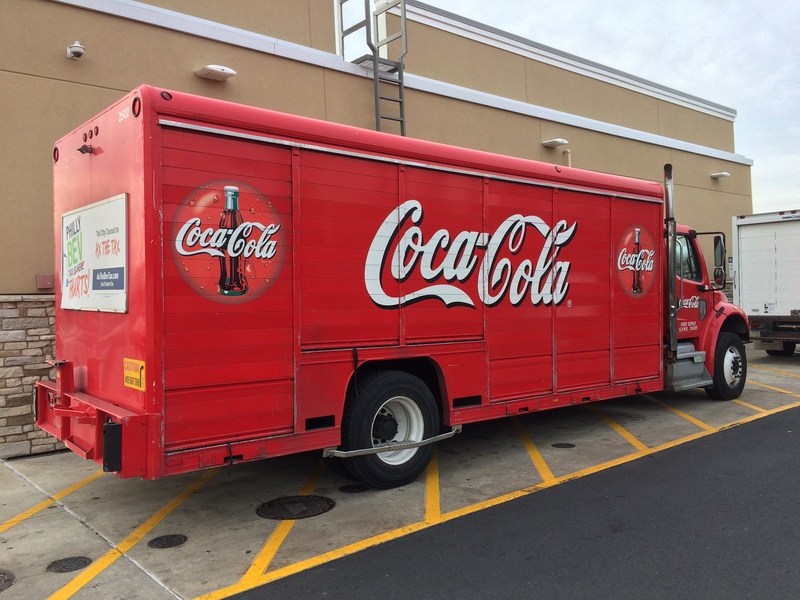 Coca-Cola trucks absolutely flaunt their red, and have for ages. The oceans of red grab the eye, entice, seduce. You want a Coke right now? I wouldn’t mind one at all. That’s an example of the kind of power that good art sometimes has over me.